Compatible with the raspberry pi 3 b+ and 3 model b. This is very fashionable color case for your raspberry pi. It's perfect for program learning and observe the data at the same time. Great way to get a lot of Pi's working together. Easy to assembly, which is good for beginner to access to raspberry pi rapidly. This is a stacking case. It can divide to 2 cases. It's really multifunctional. The fan is new updated. The greatest advantage is quite silence. It wouldn't make a loud noise when it's running. Two big heatsink and one small heatsink are provide for every layer, totally 4 big heatsink and 2 small heatsink. Please peel off the protect paper before using. Please peel off the protection tape, there are aluminum part, thermal adhesive and tape , do not take off the thermal adhesive and tape together. 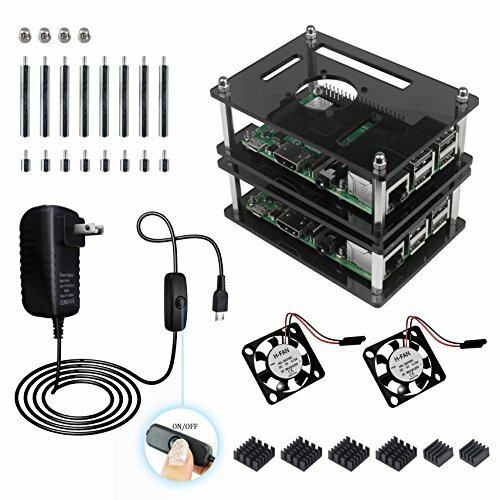 Perfect for handling several pi -- Two cases provide a stacking environment to put your raspberry pi 3 b+ and raspberry pi 3 together. Suitable SD card slot -- Great cutout position to match the pi 3 b+. New design port for SD card slot and bottom heatsink which is convenient to insert or remove. Access to all GPIO port. 5V/3A power supply with switch cable -- Direct plug-in adapter for raspberry pi. Raspberry pi power supply with On/ off switch cable can satisfy your basic require. Clear instruction -- Step by step, easy to follow. There are two set screws to beautify the case. Pick one to install with your raspberry pi 3 b+ case with fan and heatsink. High Quality Service -- Using the high quality package to make sure the product delivers perfectly. Get more technique support? The professional customer service team is keeping online for you. If you have any questions about this product by Jun-Electron, contact us by completing and submitting the form below. If you are looking for a specif part number, please include it with your message.